For the times that you need durable cement siding, you can count on DJK Siding. Sticking to our commitment of only offering the highest-quality products, we offer our customer’s the absolute best in fiber cement siding. High versatility – With dozens of colors, textures, sizes and panel styles available, fiber cement siding options run into the hundreds. Fade and Crack resistant – Highly stable fiber cement siding is meant to protect your house for years and do so with beauty and style. Low maintenance and upkeep – A fresh wash of mild soap and water is all that is needed to keep fiber cement siding looking great. Low installation costs – Because of its design, fiber cement siding is easy to install, making the cost to do so less than cedar, natural stone, wood or hardboard siding. Discover more about fiber cement siding by James Hardie by scrolling down and clicking on the link. You can also fill out the form below to get more information on the types of siding we offer, to schedule a consultation, or to ask any questions that you may have. Trust DJK Siding with your siding repairs and management. HardiePlank® Lap Siding, HardiePlank® Vertical Siding, HardieShingle® Siding, HardieTrim® Boards & more. 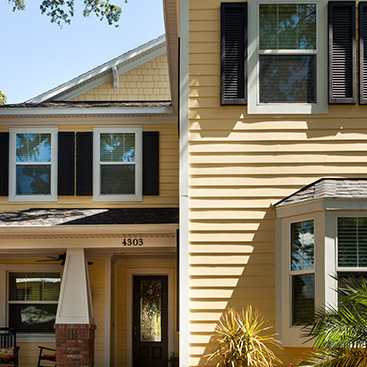 James Hardie Fiber Cement Siding will transform your commercial property or residential home into an elegant edifice.